Students of all academic years and majors at the University of Rhode Island attended the student session of the 2017 New England Association of Schools and Colleges Accreditation Review Monday night. Dr. Karen L. Pennington, vice president of Student Development at Montclair State University and Dr. Barbara Prudhomme White, a faculty member at the University of New Hampshire, led the discussion this past Monday. The administrators said they weren’t here to penalize, just to check on the progress of the University. There are nine standards issued by the NEASC of accreditation for each school—mission and purpose; planning and evaluation; organization and governance; the academic program; students; teaching, learning, and scholarship; institutional resources; educational effectiveness; integrity, transparency, and public disclosure. Pennington asked the students why they are at URI. Many stated that they were drawn in with events at the beginning of their journey. “I was drawn in by so many opportunities that I was immediately presented with,” junior Angela Quagliaroli said. Quagliaroli is a kinesiology major and she finds that the majority of her professors are very welcoming and helpful when discussing her career path. Others agreed that they love URI for the strong sense of community. 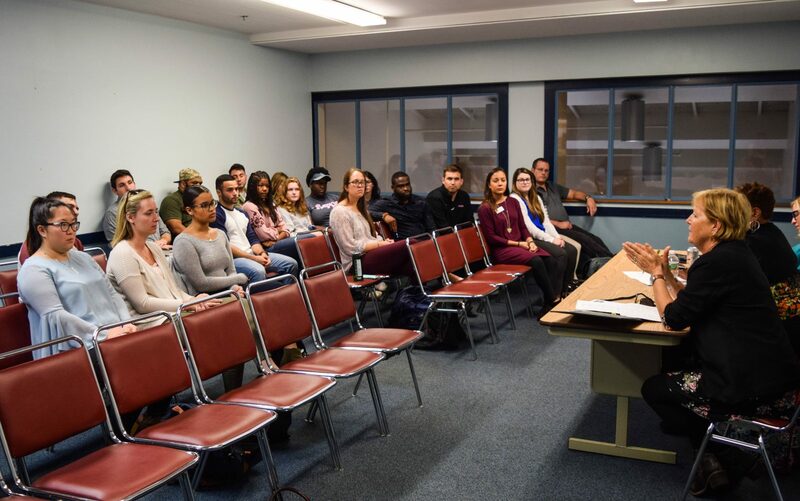 Corey Fernandez, an academic advisor and success coach for the Talent Development program, shared his experience throughout the years at URI. He started college in Wisconsin and transferred to URI after being accepted into the Talent Development program. The program offers aid to Rhode Island high school graduates who are from disadvantaged backgrounds seeking financial aid. He completed his undergraduate degree, masters degree and is now an employee of the Talent Development program. As far as transferring, many students had opinions about their experience. Many agreed that the Talent Development program provided “a very structured process” and a “structured academic pathway” for success. Students said the general education requirements prepared them for their majors. They said faculty and staff made them feel at home away from home. “If they don’t feel like they belong, they cannot succeed in the classroom,” Fernandez said. Some opinions differed regarding public schools in Rhode Island. Many of the graduate students agreed that the education provided by the state public schools “hasn’t done a good job preparing us for the college workload.” Most of the college preparation was learned as they entered college in their first semester of their freshman year. One student said she used to not study in high school and was shocked by the reality of college education and a new work ethic. Students voiced their opinions about the Academic Enhancement Center located in Roosevelt Hall which provides aid to students seeking help in writing, math, and science. Students agreed that the center provides not only academic success but success in general, putting together goals to help them reach larger goals. Despite everything the students praised, there were some issues that needed to be addressed by the administrators. Several students raised awareness of the Students First Fund which is backed by URI’s Division of Student Affairs. They said it wasn’t well-known and that more people could benefit from it if it was promoted. The Students First Fund is fundraised by students for students in a crisis that leave students with financial difficulties. Students can submit a request explaining their situation and if approved, the money does not need to be repaid. Students were raising questions about the fund and its monetary usage. Where is the money going and what are they doing with it? Other issues that were discussed was the Safety and Lighting Walk that the school provided last year. It highlighted the areas of campus that have the blue light system and safe areas to walk after hours. 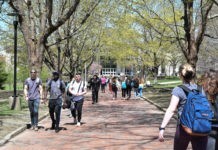 Graduate Hall Director Andreas Armenis said there have been no changes from year to year in the safety of students walking back to their cars at night. “That trumps everything,” Armenis said. He said as a man, he feels safe, but from a female’s perspective, he wouldn’t feel safe walking back late at night from the library to Plains Road parking lot. He said he thinks the University is a safe campus, but he reminded everyone that it is also a public university that the general public can enter without checking in with someone at a gated entrance. The issue of distinguishing the line between graduate students and faculty/staff was pitched by the graduate students in the room. Many believed that they do just as much work as some faculty and staff and they are expected to act like it, yet they don’t receive corresponding parking passes or fair treatment. 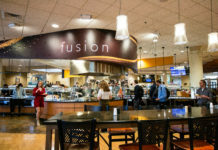 A large issue that the majority of students agreed upon was the process of entering University College and being accepted into the college of their choice of major. Many found it confusing that all first and second-year students are automatically enrolled in University College of Academic Success (UCAS) and see advisors in Roosevelt for help. It is only when they have completed a certain number of credits are students able to be officially accepted into the college of their major. Even Pennington and White were surprised by the number of students who were troubled by this process.